The embodiment of Quan Yin (Kwan Yin) in China tells how she was born into a wealthy family with a strict father who expected her to marry a wealth merchant, however she renounced this life, instead wanting to become a Nun so she could help people. She eventually left her Family behind as the only way to live her true life path. She lived in a small house spending her time devoted to the practice of Buddhism. 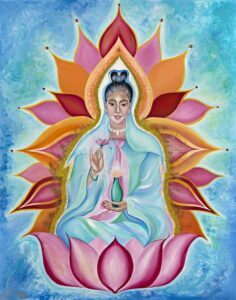 Quan Yin is very much the Eastern version of Mother Mary. She is the Cohan of the 12th Ray teaching unconditional Love. She brings through the Divine Mother Energy to empower women and to balance feminine wisdom within men with the Yin & Yang. Kwan Yin currently sits on the Karmic Board. The painting of Quan Yin was one of the earlier paintings mastered by Glenn. It shows her sitting on the Lotus Leaf symbolizing purity, peace & harmony. She is wearing a pearl necklace for health and well-being. She holds the Sacred Vase.